Almost the whole of St. Lucia’s Day has gone by, and I haven’t posted! But that’s mostly because I did write about it over at Alyssa’s awesome blog, The Shady Glade. Check it out! A special food I served for St. Lucia breakfast was meat and cheese biscuits. Here’s a recipe that I haven’t tried yet, but will sometime soon. It looks savory and wonderful for any meal of the day! Combine flour, baking powder and salt in mixing bowl. Cut in butter with pastry blender or 2 knives until mixture resembles coarse meal. Stir in cilantro, cheese, onion and bacon, mixing well. Add milk all at once to dry ingredients, stirring with a fork to make a soft dough. Turn out onto floured surface and knead 5 to 7 times (not too much!). Roll dough out 1/2 inch thick; cut into rounds or rectangles. I usually use the mouth of a small glass to create uniform circles. Place biscuits onto an ungreased baking sheet lightly sprinkled with flour. Bake at 450°F for 10-13 minutes or until light golden in color. oh goawd they look good! shame im on a diet before christmas pigout. Le sigh. The fact that I'm supposed to be dieting right now is not stopping me from attempting to make these for my family get together. They look really good! They look really good, and even if your dieting, with the right balance you can eat these. Those are going to be a must within the next few days. How absolutely yummy! yum. looks like a good and easy one to try. although the bacon my disappear before i get to the crumbling bit. 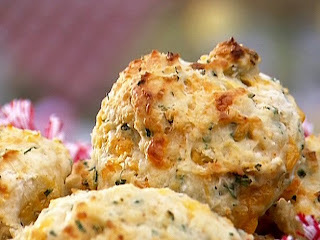 I do love to make cheddar biscuits but never thought to make them with bacon. Why not? What doesn't taste better with bacon in it? Definitely going to make these the next time I make biscuits. Those biscuits do look yummy. Now I have a sudden urge to go bake. Oh my yum! I want one of these right now. Yummy, and I know my family would love these.